I will admit it. Sometimes I watch “House Hunters” on HGTV. It’s a guilty pleasure of mine. It’s a chance to sneak a peek at other people’s homes and for a moment, consider what it might be like to shop for a $400,000 home in St. Louis. For a half hour, I can make snap judgements on clean modern houses or adorable condos without leaving my living room. But mostly I can have a bit of fun making some snap judgments about people’s decision-making skills when buying a home. I can’t seem to relate to their “needs,” which is probably why I get a kick out of watching the show. What I really want to do is to pull these people aside and tell them what they should really look for when buying a house. These are the things I wish someone had told me. Your new home should be structurally sound and well-maintained. It doesn’t matter what the house’s curb appeal is if it has structural issues. It doesn’t matter how cheap it is if it needs thousands of dollars worth of repairs. Take a close look at the paint jobs and finishes. Are they high quality? Has someone paid attention to the details? If a close look shows shoddy workmanship on the cosmetic stuff, you can probably assume they’ve cut corners on the stuff you don’t see. Make sure to ask for a home inspection before you buy to alert you to major problems. You should pay attention to the location. It may be the perfect house, but if your new home will require you to make a long commute, you may want to reconsider. Pay attention to the distance between the home and amenities like work, school, shopping, health care and parks. Is the neighborhood safe? Are the other homes in the neighborhood well-maintained? Is it there a lot of traffic? Is there a lot of noise? Asking yourself some questions about the neighborhood can ensure you don’t buy a home and end up hating where you live. You should consider the resale value of the home. The location is one factor that can have an effect on the resale value of your home. But there are other things to consider. Does the house have a great layout? Does the home have three or more bedrooms? More than one bath? Plenty of closet space? Garages and big backyards are also helpful when it comes time to sell. Good school districts and low taxes are other assets to look for. You should consider the cost of maintenance of your new home. You know that you’ll have to pay for the basic upkeep of your home, but some homes are costlier to maintain than others. Watch out for neighborhoods that have hefty Home Owners Association fees. Swimming pools can be a big drain on your budget. Think about the exterior of your home. How much will it cost to take care of your siding, roof, driveway and lawn? You should consider energy efficiency when buying a new home. Pay attention to the heating and cooling systems for the house and be sure to consider the average estimated costs for them. Those vaulted ceilings waste a lot of energy! What type of appliances are in the home and are they energy efficient? Buying a home that has good energy conservation measures in place can help you save money. You should consider the landscape. Well placed deciduous trees can provide shade during hot summers and help you keep you cool in the summer and when the leaves are gone, they can let the sun warm you in the winter. An ample lawn gives room for the kids to play and to entertain. If you’ve always wanted a garden, make sure the new home has a yard big enough for one. You shouldn’t feel rushed into making a decision. On House Hunters, the buyers only look at three houses. You should take the time to look at a LOT of houses before you make a decision. It will give you a better sense of what the housing market is like in your community and help you understand what you can afford. Realtors like to push you into making decisions quickly. It is their job to sell. But there are plenty of homes on the market and you have time to find the one just right for you. You shouldn’t buy more home than you can afford. You should have a budget and know exactly what you can comfortably afford. If you want to be smart about borrowing for your home, this amount will be less than what the bank says you can afford. Stick to your guns. There were always be opportunities to get this house or that house for just $10,000 or $20,000 more, but that really adds up! If you want to keep your debt in check, think smarter and smaller. When buying a home, it’s all too easy to get wrapped up in what the home looks like and “feels” like. Those things are just cosmetic and can be fixed with small investments over time. Consider them, but don’t forget all of the other things that really make a house a home. Your home is probably the biggest purchase you’ll ever make. Make it a good one. The public school district that you are in is often a big consideration. If you have or are planning on having kids, this is one to take a look at. Even if not, it can affect resale value down the road. I don’t get open concept kitchens. Ours is small, but at least there’s a barrier between the dining room and kitchen. We already have an open living/dining room. I think you should also consider what upgrades you’d want to make and how much they’ll cost. It should give you an idea of the overall cost of your home long-term. Thanks for these great suggestions! We recently moved from Colorado to New York and are house shopping. 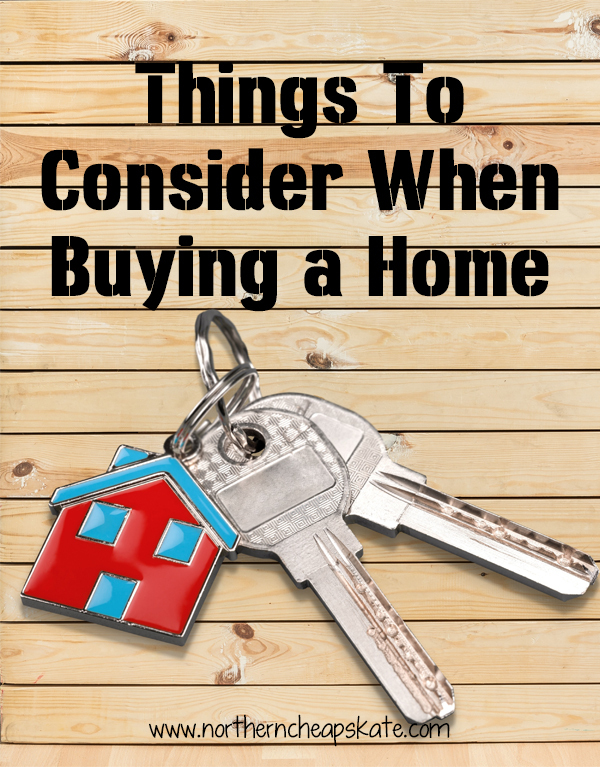 Many of these tips we know, but it helps to read over them again and not get swept up in the house hunting shows and atmosphere. I agree that school district is very important, as it’s one of our top factors. I also am looking for a house not on a busy street. We have teens driving and I don’t want them to have to pull out onto a busy street and I don’t want to worry about our young ones running into a busy street. I would rather be in a quiet neighborhood. I don’t agree about the open concept, though. I do want an open concept. I have children with special needs and they require constant supervision. The more open the concept the better for our family. If I can be cooking dinner and see them in the family room, that helps me tremendously.